As we noted a couple days ago, the so-called “Location War” was essentially an even match throughout the first few days of the SXSW festival in Austin, Texas. The services were in a dead-heat when it came to check-ins through Sunday, based on data we’d seen. But when it comes to tweets from the respective services, Foursquare, it seems, is dominating. 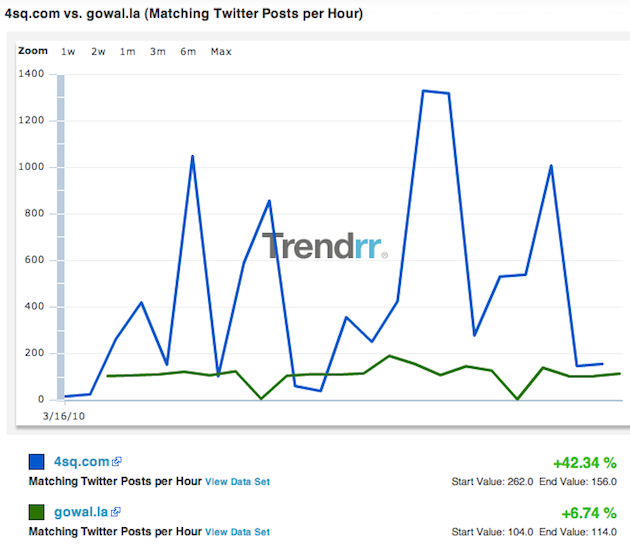 I had the service Trendrr send me some data for tweets being sent out with “4sq.com” and “gowal.la,” the short URLs for each service. As you can see in the graph above, while Gowalla has a much more steady stream of tweets sent to Twitter, Foursquare has huge spikes. In total, according to the Trendrr data, Foursquare is averaging about 500 Twitter posts per hour with peaks as high as 1,329 posts per hour. Gowalla is averaging about 100 posts per hour with a peak of 190 posts per hour. Now, a few caveats: first, Foursquare has several actions that can be set to auto-tweet, which Gowalla doesn’t have. For example, when you unlock a badge or take over a mayorship on Foursquare, many people have their accounts set up to autotweet. Then, of course, there is checking-in. Gowalla tweets out only when you check-in at a place (if you set it to do so). Second, this data is only for the past two days (Trendrr wasn’t tracking it before I asked), and it’s worldwide. The check-in data I cited for the dead-heat location war was from Austin only. That said, there’s a reason why others are thinking Foursquare is dominating Gowalla, even here at SXSW: The amount of tweets sent from Foursquare seems way above the Gowalla tweets. I’ve noticed it, as have a dozen or so other people I’ve talked to here. Again, that doesn’t mean Foursquare is dominating in actual usage, just that they have a better system set up for this type of viral messaging (which plenty of people hate). 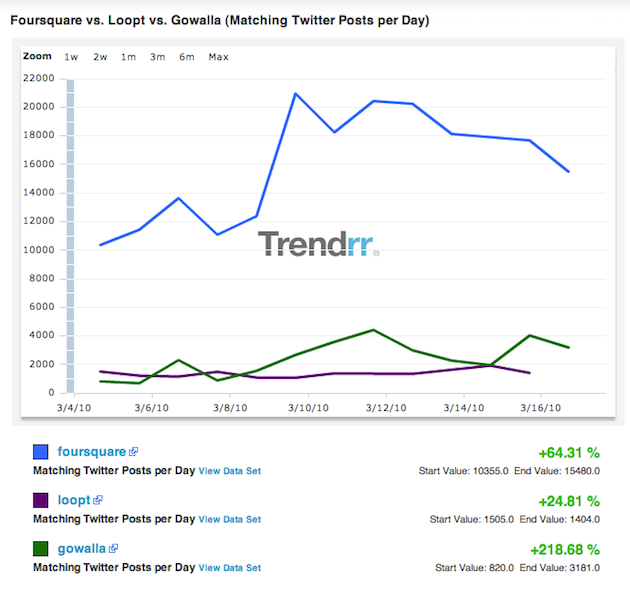 Trendrr also has more comprehensive data for the terms “Foursquare” vs. “Gowalla” (and they included “Loopt) on Twitter. There, as well, Foursquare dominates averaging about 20,000 posts a day, with Gowalla at just 3,000 a day (find that chart below). But that could also be because when Foursquare autotweets from accounts it includes the “@foursquare” branding on the end of the tweet while Gowalla does not. Look for more comprehensive data about the Location War over the next few days.